As Kosovo prepares for new Prime Minister Hashim Thaci to declare its independence in the days or weeks ahead, Kosovo society is wracked by corruption and organized crime. According to the estimate of the United Nations Mission in Kosovo (UNMIK), organized crime accounts for some 15-20 percent of the Kosovo economy: a figure that would presumably be far higher if one subtracts the substantial portion of Kosovo GDP made up of foreign aid. Some of Kosovo's leading politicians, moreover, have been accused of connections to the organized crime networks. Citing unpublished intelligence reports, recent reports in the German media have accused former Prime Minister Ramush Haradanij, in particular, of being a key figure in the nexus between politics and organized crime. Haradinaj -- like Thaci and many of Kosovo's other leading politicians -- was a commander in the now formally disbanded guerrilla army, the Kosovo Liberation Army. He is currently on trial in The Hague for war crimes allegedly committed during the Kosovo War of 1999. The U.N. administration in Kosovo has itself been accused of complacency toward, if not out right collusion with the criminal networks. John Rosenthal spoke with Avni Zogiana of the Pristina-based NGO ÇOHU! (Wake Up!). John Rosenthal: Your organization focuses on the links between organized crime and politics in Kosovo. Can you give us some idea of the nature of the problem and the particular forms organized crime takes in Kosovo? Avni Zogiani: You've had cases where politics was mixed with organized crime in a very blatant manner: for example, cases of high officials who were found to be involved in arms smuggling or in money laundering. Because of the lack of integrity of the public sphere in general and especially the political institutions, very often you will find that a part of the money that goes to organized crime comes in fact from public funds. This is one aspect of the problem. Another aspect is human trafficking: women are brought to every corner of Kosovo to be sold into prostitution. Human trafficking in Kosovo is a very big deal and also drug trafficking is a big deal. However, I think that the organized crime that has been connected to political parties has been chiefly financed from public funds; whereas the part of organized crime involved in human trafficking and drug trafficking has represented a sort of independent structure that time after time was protected by political parties, but not necessarily directly connected to them. They have often been found to enjoy protection also from the judicial system: from the prosecutor's office and so on. JR: Is that a strictly local system or does the judicial system in Kosovo today involve an international presence? AZ: It does involve an international presence and the international presence covers the most significant or difficult cases. If, for instance, a case is related to the rights of minorities, they will take it. Or if high officials are involved, they will also take it: without any explanation, international judges or prosecutors will take over the case. JR: And who makes that decision? AZ: It is the exclusive decision of the Department of Justice, which is basically run by international prosecutors or judges here in Kosovo. JR: When you talk about the connection of Kosovo's political institutions to organized crime, what persons or parties do you have in mind? Recent reports in the German media have pointed the finger, in particular, at Ramush Haradinaj and his party the Alliance for the Future of Kosovo (AAK). AZ: All three of the main political parties in Kosovo have had their informal structures: structures that at a certain time served the function of intelligence services, but sometimes they will also control illegal economic activities. JR: Does that mean also the Democratic League of Kosovo, the party founded by Kosovo's first president Ibrahim Rugova? AZ: Yes. Actually, for a time they probably had the strongest intelligence structures. For example, the head of his intelligence structure -- who also had the status of a "special advisor" to President Rugova -- was once even put in jail for illegal activities. The brother of this "special advisor" controlled a network of nightclubs involved in prostitution. All three of the biggest political parties have had their parallel structures and intelligence services: gangsters basically, who control part of the economic resources in Kosovo. JR: What has been the role of the U.N. administration in all this? One high UNMIK official, the American Steven Schook, was recently removed from his post after it came out that he was under investigation by U.N. headquarters for alleged misconduct: apparently, among other things, because his relations with Haradinaj and other leading members of the AAK were supposed to be "too close." AZ: For a lot of reasons, the UNMIK has tolerated these organized crime structures in Kosovo and their connection to politics. One of the reasons is that if you have politicians who have police files, you can control them easier: you have a tool of control. But the other reason is that these structures had the potential to derail the stability of Kosovo and security in Kosovo. But there were also economic reasons for the international officials' tolerance of the mixture of organized crime and politics. The case of the former Principal Deputy Special Representative Steven Schook is one example or indication of this. He was one of the main promoters of "Kosovo C": a new coal power plant that is a huge project. 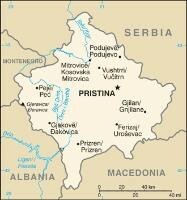 Next Page: Kosovo C was highly controversial . . .
JR: And he promoted the project in his official capacity as principle deputy to the U.N. "special representative"? AZ: Well, yes. But actually it wasn't his duty at all. He didn't have to have anything to do with it. But in any public meeting, he would always endorse the project: it even happened when he was mourning an acquaintance of his. And Kosovo C was highly controversial, because it was going forward without any study of the social or environmental impact it would have. But the project was being pushed through quickly by AAK ministers. And Mr. Schook was accused of being too close to the former Minister of Energy, Mr. Ethem Ceku, who was from the AAK. JR: But isn't it possible that Schook is being made a scapegoat? Even if he had close relations to Haradinaj, he certainly was not unique among UNMIK officials in this respect. Even after Haradinaj had been indicted for war crimes, the former head of UNMIK, Søren Jessen-Petersen, famously described Haradinaj as a "close partner and friend." And the current head of UNMIK and Schook's direct superior, Joachim Rücker, met with Haradinaj only days before he left for The Hague to stand trial. He did so even though prosecutors at The Hague reportedly requested that UNMIK officials not have contact with him. AZ: Well, the reason why Schook was tackled by the U.N. office is that he was being too conspicuous, too blatant, in everything that he was doing. He had become an embarrassment. He and Ceku were living kind of a life of Cosa Nostra here in Kosovo. JR: Let me ask you about the prospects for the future development in Kosovo. It's widely expected that sometime shortly after the Serbian elections, the new Kosovo Prime Minister Hashim Thaci is going to declare independence. The EU has already made clear that, even without a U.N. Security Council mandate, it intends then to implement the so-called Ahtasaari Plan, which does not in fact foresee full-fledged independence for Kosovo, but rather "supervised independence." At that point, if the plan goes forward, an exclusive EU "mission" will replace UNMIK. But does that resolve the problem? From everything you have been saying, one could wonder whether the international presence has not in fact favored the development of organized crime and corruption in Kosovo, rather than limiting it. AZ: You know, whenever I try to give a kind of figurative explanation for the situation, I say that corruption and organized crime is the child of two parents: Kosovo's institutions and UNMIK. They have given birth to this child together. Today, we have this situation because of the duality of authority. For example, if we tried to identify who is responsible for a certain failure of the rule of law and we went to the former Prime Minister Agim Ceku, Ceku would always say that the matter does not fall within the competence of the Kosovo institutions: it falls within the competence of UNMIK. Then when you go to UNMIK, to put pressure on them and explain that a certain part of organized crime was being tolerated, they will say that it is up to the Kosovo institutions to cleanse themselves. So, in the past, it was this confusion concerning the lines of accountability that was the reason why Kosovo became probably the most extreme case of corruption and organized crime in the Balkans. But our organization believes that it is not going to be a similar situation with the future EU mission. Not only because the EU has a better reputation on tackling organized crime, but also because Kosovo is at the doorstep of the European Union and whatever happens in Kosovo, Europe will be very much exposed. For example, you have a lot of human trafficking passing through this territory and Europe is directly suffering from the toleration of these organized crime structures. So, Europe has a more direct interest. JR: But the EU has always played a predominant role in UNMIK. The EU was already fully responsible for the "economic development" pillar of UNMIK. And, as you know, every one of the UNMIK heads has been a European: starting with Bernard Kouchner to Rücker today. Even if they are officially named by the U.N. Secretary General, they have in fact been chosen by the EU. The EU already bears enormous responsibility for the existing situation in Kosovo. So, why should the EU's unilaterally assuming exclusive responsibility serve to improve it? AZ: There was always an American deputy special representative who was very powerful especially in the fields of judiciary and the police. Very often the Department of Justice was led by an American and most of the security structures were subordinated directly to the American deputy special representative. JR: But the head of UNMIK's "Pillar I," which is responsible for the judiciary and the police, has likewise always been a European. In fact, I wonder if there has ever been a head of any of the four "pillars" comprising UNMIK who was not European. In any case, even if one assumes that the EU will be more effective without the U.N. or the U.S., the structural problems that you've identified remain. So-called "international administrations" are by definition antithetical to democracy and self-government. So, couldn't one conclude that it is in the very nature of such administrations to breed a certain sort of corruption in the local society? AZ: Of course, the best case would be if the people of Kosovo would be allowed to have a more extensive autonomy in ruling their country. This would bring with it all the typical problems of an underdeveloped society without any experience in governing itself. However, it would provide an opportunity for the people to test its leadership, without the leadership being able to divert the responsibility for its failures. The weak lines of accountability would eventually get stronger as the mystique that has surrounded the main leaders would dissipate. This hasn't happened so far, since the international officials were obsessed with security and were not concerned about the rule of law. As a result, the "strong figures" in the political parties acquired total impunity and society fell into a kind of lethargy: People lost hope that they could influence their government and did not see any prospect for success in the fight for the rule of law. I am not saying that an EU mission is a perfect solution, but it's the only hope to curb the dominance of the extraordinarily wealthy and incriminated politicians. The latter can still claim to have credibility and play at being patriots, because they can blame the international officials for their failures. Avni Zogiani is one of the founders of the Pristina-based NGO ÇOHU!. He previously worked as a reporter for the daily Koha Ditore.